You know those places that you forget about and then, when you go there again you always say to yourself "I've gotta remember this place and come here more often." One of those places for me is the Garden Bistro in the Vista. My good friend Ellen loves this restaurant and is a regular. I recently met her there for lunch and had that "why don't I come here?" moment. For those of you who do not know the Garden Bistro, it's a cute little place that's decorated like a patio. You're inside but you feel like you're outside. It's tucked away behind the Art Bar so you kind of have to know what you're looking for. The cool thing is that it's in the Vista, but its got an enormous parking lot right outside its door. Parking is quite the rarity in this part of town. It's a locally owned restaurant with daily specials and a really good regular menu. Lots of fresh sandwiches, salads and soups. 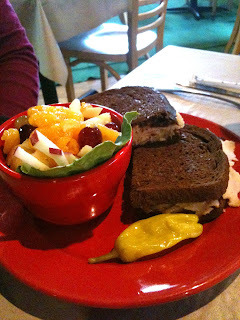 When we went the other day, Ellen got one of the specials which was a turkey reuben. It looked just awesome and I may have to get that next time. 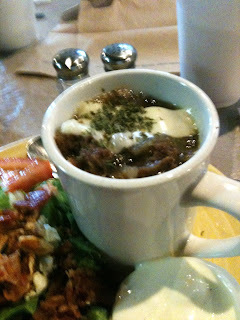 I chose a salad and soup combo: BLT salad (I'm a sucker for bacon) and French onion soup. I loved them both! It was a perfect size for lunch and the taste was fantastic. If you read restaurant reviews on sites like Urbanspoon you know that Garden Bistro gets rave reviews all the time. Comments tend to focus on freshness, variety, flavor and that it's a good local joint. The atmosphere is comfortable, fun and creative. They have a loyal following of regulars and deservedly so. Sadly, the owner of the restaurant recently passed away from kidney disease at a much too early age. I did not know him, but Ellen did and she (and many others) are greatly saddened by his passing. I hope that Columbia's continued patronage will help keep his memory alive and will help his family continue on. Garden Bistro definitely is a keeper in Columbia's dining scene. Valid point, I never really think about going there either even though it is always great! I think the only time I had it and didn't like it was once when I got it too go and it got soggy. It was a Super Bowl!